A provider of K–12 applied learning resources is out with an improved interactive lesson platform that seeks to support digital classrooms. 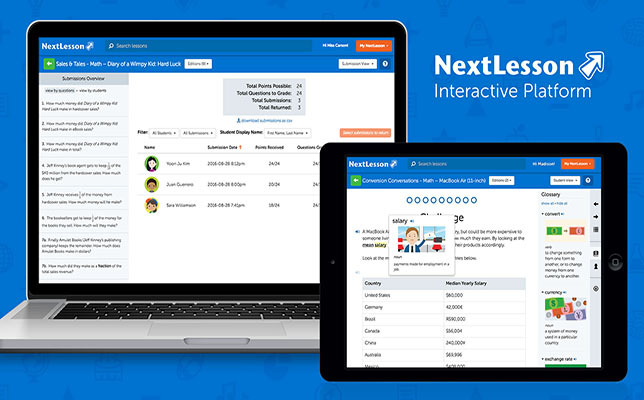 The updated NextLesson platform enables lessons to be assigned, completed and graded online. After receiving feedback during its beta version, the platform now features a more intuitive interface with features to support teachers and students. A user-friendly toolbar provides easier access to lessons, which users can browse through by type, and allows users to share lessons. Additionally, the new “Submissions View” feature teachers to view timestamped responses by question or student, see suggested answers and score students work. On the student side, lessons now have text-to-speech audio and glossary terms, and they can submit responses and receive feedback from teachers. "To prepare students for the real world, NextLesson creates applied learning opportunities which develop critical thinking and technology skills," said Dion Lim, founder and CEO of NextLesson, in a prepared statement. "Now our platform offers a foundation for better delivery and grading of lessons for teachers and additional support for students, particularly struggling readers and English language learners." Launched in 2013, NextLesson has engaged about 60,000 teachers and more than 2 million students across the country. To learn more about the interactive lesson platform, visit the NextLesson site.